In just a few days Rocky Mountain Con will be starting. They teamed up with Tacticon this year so it adds a lot of new stuff to this amazing show. We will be in artists ally this year come find us and our members that have tables this year in artist ally. We will be participating in a scavenger hunt with some other lucky people. Also we will be doing our free sketches for kids. So stop on by come say hi and hope to see you all at RMC 2017 this year. Also this Friday after the con floor closes Red Team Go will be hosting A’bout to draw at the bar area of the convention hotel. 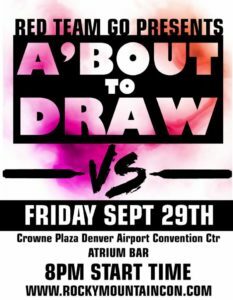 Come watch artists battle it out with paper and a marker. You decide what they draw and who the winner is. It’s time for Denver Comic Con 2017!!! !